Updated Sep 2017: A lot of friends and family like this stages of wealth to let them know whether they are improving their wealth progressively. However, the problem for them is that after they achieved Debt Freedom, there is a chasm between Debt Freedom and the next higher rung, Financial Security. In this update I provide 3 more stages that you can aim for in your progression to financial freedom. Updated Aug 2018: I have not updated any stages, but I have shared my thoughts on some stages that might fit for you, but not for everyone. Theses are Freedom from Employer, Flexible Financial Independence, Half Financial Independence. Measuring how wealthy we are has always been subjective in real life. When we meet up with our friends, and family during gatherings, our conversations gravitate to what we own, what we work as, our aspirations and struggles and where we been to. And inevitably, that is how people around measure how rich you are. One thing you realize is that, many people perceived us as being rich by what we show on the outside. This can be deliberate or accidental. So when you met me outside, and see that I drive an Audi, you would have perceived that I am doing well in life. But if you are servicing your home loan and use what you have to get an Audi with more car loans, you are a good story and conversation during lunch, but does this profile fit someone who is considered wealthy? By presenting this way, material appearance on the outside does not equate to a person being wealthy. My peers tend to respect those that are vastly richer then them. They treat folks with much more wealth then them as superior beings and those richer always have a way to make use of that position due to monetary status to get what they want. They cede a lot of power because they felt that they are not in a confident position. If you are self confident about where you are, you can talk to others as equals. We often equate having wealth to having power, and thus having confidence. And to a lot of people, things are binary: you are not rich or you are rich. I think we can slowly improve our financial position. We can work our way up one step at a time. When we work our way up, we recognize that we have improved ourselves in terms of wealth attainment. This gives us more power and confidence. And with more confidence, we can have greater success in tackling life. The picture above shows how building wealth is. You are not going to get there immediately. However, we can have various significant wealth milestones along our journey to aim for. In this article, we listed out 11 different stages of wealth that a family or a person can be in. As a wealth builder, we treat wealth building as a life journey and progress from Stage 0 to Stage 10. I wasn’t the original creator of this set of milestones. 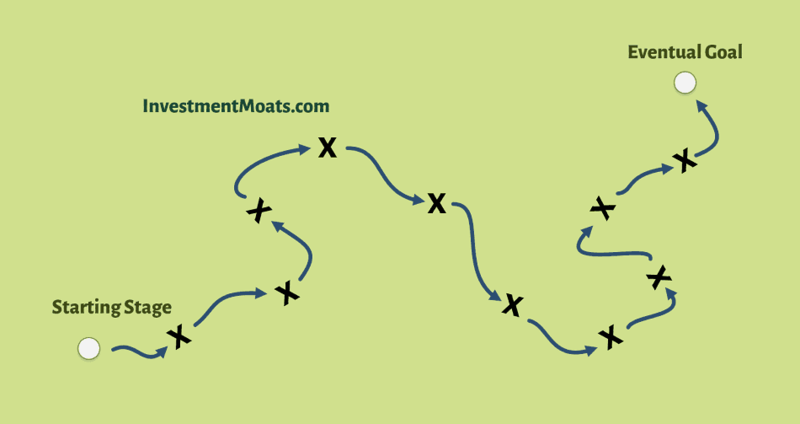 Joshua Sheats from Radical Personal Finance formalize these stages and there is no reason to take and change it when they describe the progression very well. Over time, a few other financial bloggers have their take on this including JD Roth, FI180, and Morgan Housel. I would say reading their article gives me a different perspective, and let me know whether there are significant stages that I should be adding to my existing stages of wealth. Let us go through these stages one by one. A person at this stage, to put it simply have a lot of baggage. Firstly, he or she has to depend on others for survival, for extravagant things or to take care of daily expenses. Net Worth is usually what we use to determine if a person or entity is in a good financial shape. A Financially Dependent person have a negative net worth meaning the assets that he has is less than the liabilities. A Financially Dependent person has to borrow consistently from banks, institutions, friends and family for the lifestyle that he or she lives. You might see him always driving the newest cars, switching from a HDB flat to a condo and bringing his family to European holidays for 3 years in a row. If you assess his net worth it might be a different story. Secondly, a financially dependent person is unable to keep his cash outflows below his cash inflows. A Financially Dependent person is likely to have a net cash flow that is negative. How can a person spend out more than he or she earns? Because you can borrow from others. You can get your family to pay for your house or give you an allowance. The latter is a good situation to be in. But is the person DEPENDENT on others? Yes he or she is. When you are dependent on others, the person have some hold over you. In this case, they are your friends, boss, company and the banks. If they are not happy about something, they can push that situation to you to create stress in your life. Can a person be having a positive net worth yet net cash flow negative? Yes. The person may have assets that is of value, but his family members are servicing his assets. He may also have lost his job, move on to a lower paying position, but still keeping his cars and big house, but having a very problematic time servicing his home. Can a person be having a negative net worth yet net cash flow positive? Yes. The person owes some debt, but he is keeping within payment which is a good thing. The person may be making a conscious effort to pay down the debt or to build up the assets. He could be taking on debt for studies so that he can earn more in the future. But is the person dependent on banks or family members at this point? Likely yes. Financially Dependent can be good or can be bad, we are not demonizing people at this stage. It depends very much on what the person builds up in his assets. If a financially dependent person proceed to improve in how he or she manages the wealth, they become Financially Solvent. They are not behind on their liabilities payments. This means their net cash flow is positive. A person that is financially dependent and progress to this stage shows either higher motivation, a change of their money beliefs and values, a more conducive environment that assisted them to realize they need to be more responsible. As their net cash flow is positive, they can start putting money away to building wealth, paying down more debts or saving for some goals. 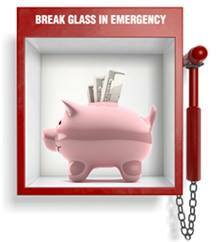 A person proceeds to achieve Financial Stability when they manage to build up some emergency funds. A person’s emergency fund, is more important then paying off all his or her debts. Without the emergency fund, a financially solvent person would be paying off his debts with all his net cash flows and one hospital emergency, and he would have to turn to his credit card or other family members for help. An emergency fund of $3000 helps a lot, even if it is not the full amount we usually recommend. To find out how an emergency fund works and how to build it up, you can read this comprehensive guide that I wrote. A person that achieves Financial Stability tends to have achieve Financial Solvency as well. Debt Freedom is achieved when a person is able to pay off all his or her debts. That seems drastic because for most people, their mortgage is 25 to 30 years, which means that it will take a long time to be free from debt. However, we tend to consider Debt Freedom to be achieved when the person paid off all their high interest debt except mortgage debt. Mortgage debt due to the duration and that the banks can foreclosed and sell off your place, tend to have the lowest interest, and essentially a dwelling is important to some for stable family building. A person that achieves Debt Freedom tend to have achieve the previous 2 stages as well. You have cleared most of your outstanding debt that are high interest, leaving you with the low interest mortgage debt. It is time to start accumulating wealth. You can follow my Wealthy Formula. This is the formula how most people build wealth. The gurus you encountered will say the same thing. The first milestone in wealth accumulation is to accumulate 1 year of annual expenses. It is made popular in urban culture of having $X so that you can fire your boss, tell your company off. Basically, you have more control over your situation versus when you are a slave to debt and your job. Suppose last year, you spend about $25,000/yr in expenses. The first wealth accumulation is to build up this $25,000. Once you attained this, you have a little optionality. Suppose you think there is much more to your capacity if you leave this job and focus on a separate work domain. You can make this fork because you are alright for one year. This is similar to Stage 4, but you have build up 5 years worth of annual expenses. Suppose your annual expenses still hovers around $25,000/yr. If you achieve $125,000, you might be able to take that sabbatical for 2 years, then come back to work. Alternatively, it can be viewed as you got a 5 year extension to make some life or work projects work. Stage 6 builds upon stage 4 and 5. It is a larger sum. So you try to build up 10 years of your annual expenses. Suppose your annual expenses hovers around $25,000/yr. If you build up $250,000, you have ample room to maneuver. 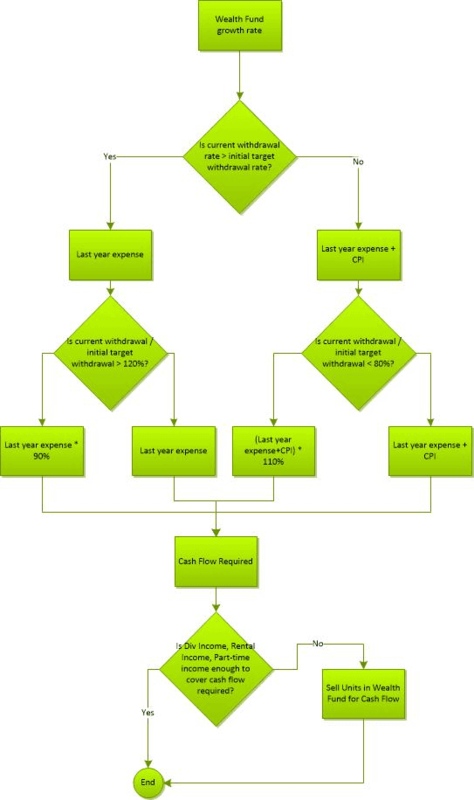 The difference between this stage 6 and stage 7 is that, stage 7 requires your wealth machine to provide a cash flow, while leaving the capital intact, stage 6 looks as though you will spend down your principal capital. 10 years of annual expenses is much synonymous with a couple building up money so that one spouse can be a stay at home mom for 10 years. As you accumulate wealth, your wealth can be put into financial assets that you can manage competently. We call this your Wealth Machines. When the person develops these Wealth Machines, their wealth fund would grow and be able to distribute wealth cash flow either by selling off assets systematically, or in the form of interest income, dividend income, business income. Financial Security is reached when your Wealth Machine(s) is able to provide a wealth cash flow that is greater than your annual survival expenses. The annual survival expenses is not all your current expenses, but is the minimal amount that, with this set of expenses paid, the family does not go hungry and can live on. There are no luxuries or rich living here. For example, your annual expenses is $25,000/yr. However, out of this $25,000, your survival expenses is $14,000/yr. 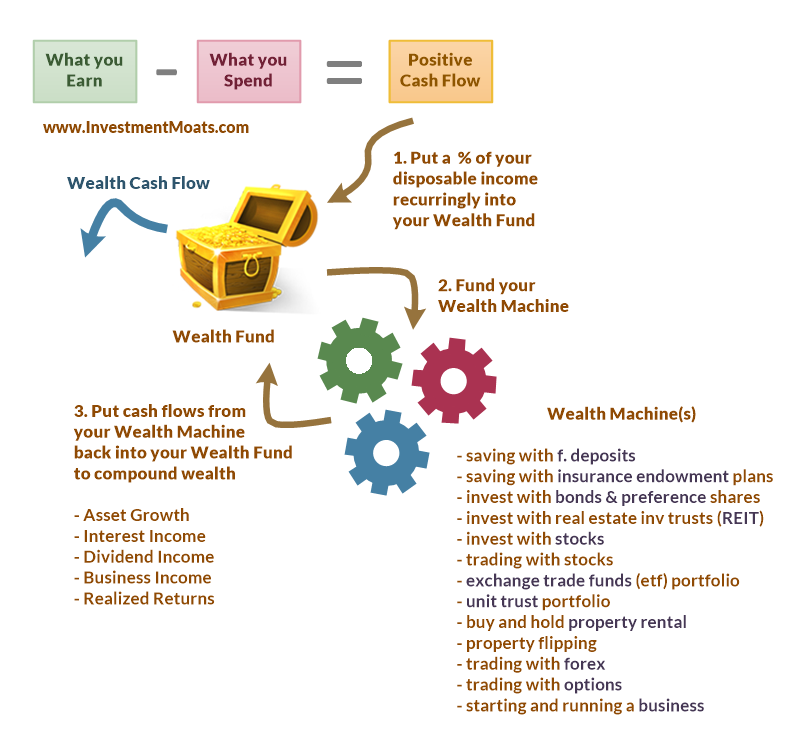 If your wealth machine can provide a rate of return of 7%, out of this, you can take a wealth cash flow of 5%. You will need to accumulate $14,000/0.05 = $280,000. With $280,000 you reach some sort of financial security. You keep your capital relatively intact, while you can conservatively cover your annual survival expenses. Financial Security is a stage that is very attractive because it gives a person optionality. It enables the person to make a riskier career move without worrying too much about the repercussions, take a break from work, or pivot to semi-employment. The person is one who do not have to give a crap about how the boss thinks when his basic survival is not determine by the moods of his or her boss. Financial Security, in the Financial Independence space is also known as LEANFIRE. LEANFIRE stands for Lean Financial Independence Retire Early. Instead of aiming for the wealth assets to be able to provide a wealth cash flow that covers all your annual expenses (stage 8 later), LEANFIRE aims to achieve this by covering their basic necessary expenses, with less money. Related: How much wealth do you need to achieve financial security, financial independence and retirement? Stage 8 is a progression from Stage 7. Financial Independence happens when your Wealth Machine(s) is able to provide a wealth cash flow that is greater than your annual current expenses. It should also be noted that your wealth cash flow distributed needs to be conservative enough when compared against the long term average rate of return of your wealth machine. Building on the previous example, suppose your annual expenses is currently $25,000/yr and that you believe you can maintain your annual expenses around $30,000/yr plus inflation, you can calculate how much you need. The formula is the same as my article above on how much you need to achieve financial security, independence or retirement. You will need to accumulate $30,000/0.05 = $600,000. We can rate a person having an Audi as rich, but to me if a person has an investment property and a portfolio that provides a wealth cash flow covering what he and his family needs now, that is truly a position to be enviable. Once you are past stage 7, the rest is the stuff of fairy tales. Financial Freedom happens when your stable of Wealth Machine(s) is able to provide more than your annual expenses but also one or two extravagant things that have previously not considered. What is life if you slog so hard and not get to enjoy? When a person reaches financial freedom, he can throw in a few things that they have denied their family for the longest time, be it the premium car that they wanted, or one more holiday for the year. The difference here is that these new spending goals weren’t a consideration before this stage of their lives. The last stage of the list is Financial Abundance. A person and his family is really rich when, his net worth is very positive, and his wealth machine(s) provide a level of cash flow that expenses accountability can take a back seat. This is to say that the cash flow is so strong that they can provide for the family and other goals that money doesn’t run out easily while at Financial Freedom, careful considerations still has to take place. When your friends or yourself have reached this stage, you are probably at the top 1% of the place that you live. It is likely you will not have an issue sending your niece to an overseas education out of goodwill, throw an extravagant birthday bash for your daughter’s 21 year old birthday or help fund that poor family that got into trouble whose story was all over the newspapers. Now I have this stage of wealth for some time already, and many readers love it because they can see where they are, and what is the next rung. There are also many folks that ask me some questions about it and I felt that there are some stuff that I can spend some time to explain. There are also a few stages that, I was debating hard whether to include them or not. And as of now, I did not include them. However, I will explain them here and you see if it fits something that you can identify with. If it does, you include it. This stage is interesting. It is a milestone we reached when we feel we are not afraid to fire our company, and go to work with another one. Is wealth an important determinant? A young working adult would think money matters less. That is because she could be at Stage 0: Financial Dependent. If she quits, her parents will still provide her with an allowance. She can still maintain a rather good standard of living. However, when you have a family, leaving a job when you do not have another one planned can create a lot of anxiety. You do not know if you can find a job that pays as well, to cover a lot of the essential needs. Thus Freedom from Employer could become a valid stage. So how much you need? This is very subjective because for each of us, our boldness to leave our employer would vary. One way of computing is perhaps a percentage of your future financial independence amount. Perhaps 10%. Essentially Stage 4 to 6, different levels of F-U Money, is to address your confidence to have freedom from employer. This stage, can be equated to your ability to take a sabbatical. Between the stage of 1 year of F-U Money and Financial Independence, you could probably squeeze in 3 more stages. This is to let you know where you are in the journey and serves as motivation. However, the reason I did not include them in is because I would rather include more novel stages, whose names tell us how functional they can be. I have already violated this by having 3 stages with F-U Money. There is also the problem of sequencing. For some, Half financial independence might be earlier than Financial Security, and for some it might be later. I would rather treat that for most their essential survival expenses is about half or three quarters of their total annual expenses they need. So financial security is good enough. There is one advantage of tracking Half Financial Independence, and that is, it means one spouse is essentially financially independent! This is one possible stage that might rest between Financial Security and Financial Independence. Essentially, we articulate the stage of financial independence as the wealth machine is able to provide a reasonable rate of return over time. Out of this rate of return, we decide to take distribution a conservative amount as wealth cash flow. In this way, we can have a high degree of confidence our Wealth Machine can Grow, and still distribute Wealth Cash Flow for a long time, instead of running out. Flexible Financial Independence is when you haven’t reached this sum for your wealth machine, but your wealth allows you to take risk to live off, should you need it. For example, your aim is to have $600,000 to be fully financially independent, based on withdrawing 5% of your portfolio. You have not reached this sum yet. You only have $480,000. But you deem that this is enough for you to be flexibly financially independent. What this means is that you can withdraw 6.1% of $480,000 and get nearly the $30,000/yr you need. Is this conservative? Probably not. You might run the risk of running out of money earlier than expected. However, you can implement a variable spending plan. We call this a variable withdrawal system. I have written how a variable withdrawal system would make $500,000 adequate for me if my expenses is $24,000/yr. You can read it here. You could have a workflow like this to make things systematic, as in my article. Why don’t I include flexible FI? I think its difficult to see where it resides. For myself, Financial Security is Flexible Financial Independence. For some Half Financial Independence is Flexible Financial Independence. For some, they can never be flexible! If this works for you, you can include this. Summary: What Can You Do Next? After showing these 11 different stages, you will realize that it is easier to infer wealth from material goods then this meter gauge. A positive net worth and a negative net worth not to mention the strength of a person net cash flow shows stability, security, optionality. This also means there may be more to that story then what we see on the front. You might be richer than the person for all you know. How do you progress upwards, through the various stages of wealth? You can start with my FREE Building your Wealth Foundation series of articles, where I explain in detail the simple steps that you can do to put yourself in a strong foundation, and then move up the stages. On an individual level, how do you measure in this 11 stages, has anyone achieve some sort of financial stability, debt freedom or financial security yet? By your definitions, sad case, i hardly reach stage 4. And i am already one leg over there. Have to lower my standard of living. hi uncle temperament, do you mean you are still in debt? No lah never in debt in our life. We are quite paranoid about getting into debts. Especially my wife, if we took a gamble into property with debts & speculation, when we were much younger, we would have pull it off with handsome profits already. But then at that time, who could have tell the future? i only believe people who wants to start a business only will be in debts. If bankrupt still O. K. leh! i try to generate cash flow from assets to cover for all my expenses but not so easy leh. Still have to draw down my capital by about 2 to 3 % yearly . That with inflation will kill us in no time. It’s still O. K. if don’t want to leave a legacy behind. uncle temperament i was wondering if we talked about survival expense do you need to draw down your capital. No body can really smoked you. But then, at my age, tend to spend more on the wants of life. If I don’t have to leave a legacy, then we have really no worries. It’s still manageable though but we should know when if necessary we should cut down on our wants. We better pray that not down to zero, one day. That’s why still have to invest some capital in stocks. Albeit more Kiasi or Kiasoo ways of investing. no worries uncle temperament i fully understand that. leaving too much is also a problem. I think you are really sharp. You are right for basic living, we have more than enough. It’s all the wants in life we are indulging that may do us in. Besides, we have to leave legacy behind. Pray that we can enjoy some of the wants as Long as we can afford. At our age, if we can not enjoy some of the luxury in life now, why then we accumulate & accumulate in the past. But we should be careful if we can’t accumulate more at this stage of our lives, at least we should try to preserve our assets/capital. So we should not run out of money before we run out of life. i think everyone basic aim or responsibility should be the same. Still at stage 4. Hahaha, am thinking of going into semi retirement in 3 yrs time. that is so great to hear! how many years have you been on this challenging path towards being financially secured? Have been saving like mad since in the mid 20s. So, is ard 17 years. I am 42 this year btw. My target is to wind down bits by bits by age 45. My portfolio is around 950k (incld CPF) as at this year. Congratulation! —– they say the 1st Million is the hardest to make or reach. There after it should be easier. Do you agree? i think after that if you can rinse and repeat with ” how you get here” without getting too much into unforeseen troubles, you shall be more & more prosperous. Yah, Temperament, I totally agreed. In fact, i feel that the first 100k is the MOST difficult to hit. After that, it is bits and bits effort to hit another 100k and so on. I am a v simple person. After my 1m, I would like to slow down my pace to do things that I really want/like at age 45. Dun wish to slog so hard liao. Life is too short to slog. hi Windytree, what would you like to do then? Have you thought about the lifestyle? hi Windytree, congrats its a nice amount to have! and the only regret is if you can draw down on the cash flow from your CPF! tell me, what does saving like mad actually look like? a lot of self sacrificing? I have seen my share of pple been retrenched and they gotta to downgrade their houses/cars and use the cash proceeds for day to day expenses. Also, invest part of the savings into stock market. Although it seems like a lot of sacrificed on my part, but since young, I dun understand what is the big deal of having a car, staying in condo and having branded goods? Cash is always king in any era. So, to me, it is just my way of staying alive in SG. hi Windytree, your account sound like me really haha!Life is just good as it is. Are the retrenchment case studies a recent thing? Sorry for duplicate or triplicate. We are at stage 7 or 8, but most likely 7 as things are evolving as we live on. Our parents will grow older and they will need our support in terms of medical fees. Our children will grow up and they will need education fees. I read your latest post and thinking of a coasting FI, doing more investment related stuff, reading more books and attending AGMs. Thanks for updating. You look like you are in a good situation. I think most of us do not have a Fat sum of wealth such that we can safely tell ourselves we are at stage 8. Until then, usually we are at stage 7. Things can be made more certain by deliberately exploring the future costs. I urge you to do that to empower yourselves. “For example, your annual expenses is $25,000/yr. However, out of this $25,000, your survival expenses is $14,000/yr. Confused on the “rate of return of 7%” statement. Where does it fit into the equation?